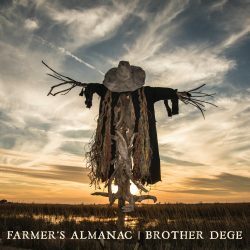 You can feel the heat and humidity in this homage to rough, rural life; the grit, grime and sweat involved in dragging a living out of the ground as a poor sharecropper just oozes out of this latest release from Louisiana’s Brother Dege. Grammy-nominated for his contribution to the soundtrack for Quentin Tarantino’s ‘Django Unchained’, Brother Dege, aka Dege Legg, is a genuine southern States diamond in the rough; a musician and writer whose slide guitar playing has been described as “Robert Johnson on thorazine”. This is modern, earthy, country blues at its best, suffused with a dark vein of Cajun craziness and American gothic storytelling that could’ve come straight out of a Washington Irving story. ‘Farmer’s Almanac’ sounds as if it’s probably as much about Legg’s own clashes with authority and “small town attitude” as it is about the rural experience but this is billed as a concept album rather than an autobiographical one and you can see the story he’s pushing in the song titles – ‘Country Come to Town’, ‘The Early Morn’, ‘The Moon and the Scarecrow’, ‘No Man a Slave’ – Brother Dege tells a tale about the ‘white trash’ experience in backwoods America and it’s a compelling story, if not a particularly happy one! There are a lot of good songs here, all delivered with a conviction that gives some indication of Dege Legg’s own battles with his various demons. Like many good bluesmen Legg has battled with addiction, depression and the many problems of being an outsider. If any track on the album sums this all up it has to be the outstanding ‘Aint No Man a Slave’. It can only be a matter of time before this gets snapped up for a TV drama or film soundtrack. The one thing that, slightly, detracts from the album is that the music does occasionally sound a little filmic – almost as if Legg is hearing a soundtrack when he composes, rather than writing stand-alone songs. Coupled with the fact that this is a concept album, you have to wonder if Legg finds it easier to compose when he thinks in terms of a longer narrative than the simple three-minute song. All these songs stand alone quite happily but the links to each other are obviously there which leads to the suspicion that Brother Dege finds it easier to write in this way. The sense that he sees this almost as a soundtrack album to an unmade film is strengthened by the opening and closing tracks – instrumentals titled ‘Partial to the Bitters’ (Parts 1 & 2) that do sound very much like part of the soundtrack to an old spaghetti Western and Brother Dege’s future may well lie in composing for the screen. In the meantime, enjoy this album for its excellent songs and fine slide guitar playing. Good songs and excellent slide guitar work mark this as an album to seek out.